I’ve made several trips to Whittier Blvd in East LA this year and the local taco truck scene seems to be pretty impressive. During the day you are more likely to see Raspados trucks but if it’s night time and you’re on Whittier Blvd there are plenty of taco trucks. 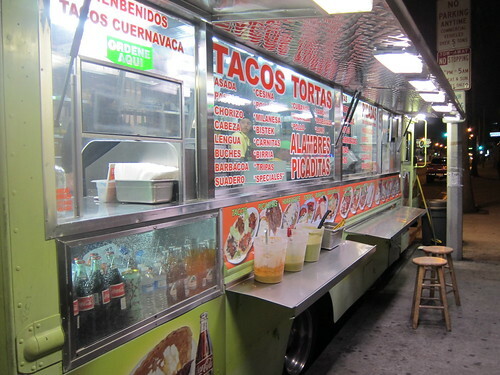 And if you don’t know which taco truck to hit up, well the answer is easy; just try them all. 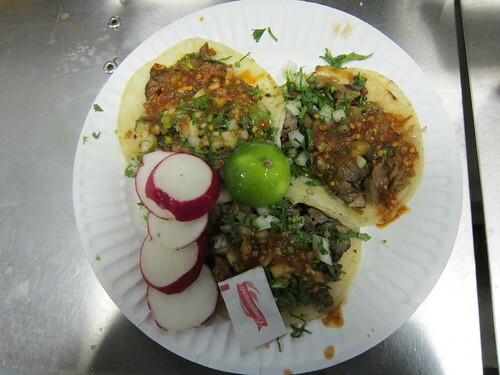 You could start your hunt at Tacos Oaxaca at Record Ave and Whittier Blvd and then head east. 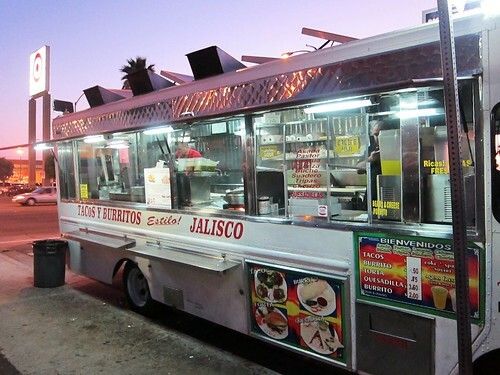 Add these taco trucks to the itinerary to get a taste for the local taco flavor. 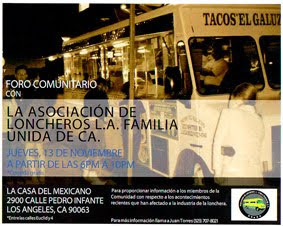 Tacos Arandaz parks at Whittier at Goodrich Blvd. 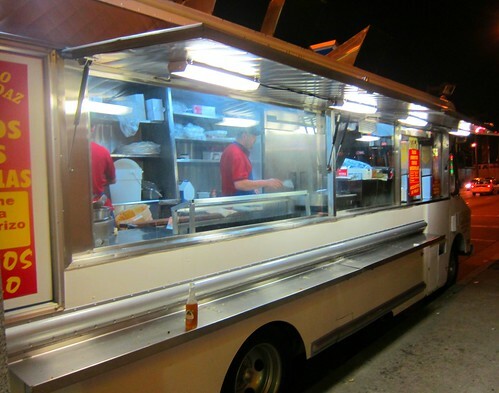 It’s here where you will find classic LA taco truck tacos: finely diced meat with minced onion, cilantro, and a spicy salsa roja. They didn’t have the al pastor spit up but the pork was juicy with good seasoning. The carne asada went well with a squirt of lime and the salsa roja. Everything was working here: nicely oiled tortillas, good meats, and a spicy salsa. I could eat here all the time. 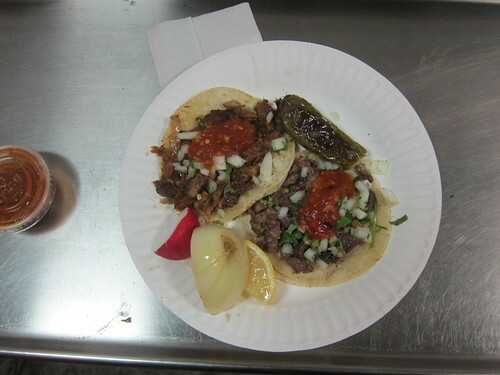 A few blocks east at the corner of Whittier and Eastmont you’ll find Tacos Cuernavaca. The tacos here come on medium sized tortillas and are only $1 each. The carne asada and suadero are both excellent and hard to tell apart. They use diezmillo for asada, and the suadero was lean with no fat. Usually suadero has a little gristle to it, but this was all meat. 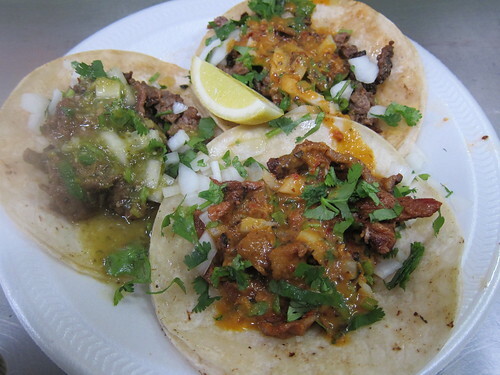 I’ve had better al pastor but only if you count Tacos Leo and Tacos Tamix. The orange-ish habanero is awesome but if you don’t want your forehead to sweat a little stick to the milder salsa verde. These are big tacos for a buck and if you’re doing an extended taco crawl you may want to just order two of them. They’re good enough however that no one would blame you if you couldn’t resist to “dos mas”. suadero with salsa verde, carne asada and al pastor. Further east on Whittier is Tacos El Galuzo. They advertise a $2 bean and cheese burrito, which I couldn’t pass up. The burrito was pretty damn good with a nice balance of white cheese and flavorful beans. 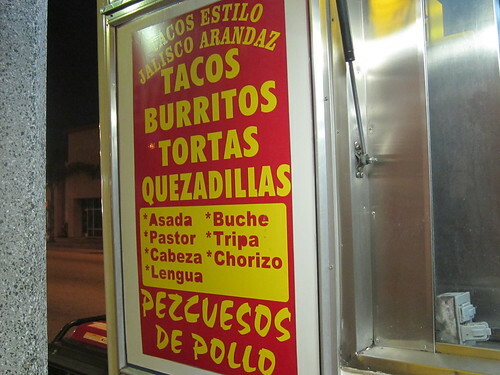 The tacos are similar to Arandaz; both advertise as Jalisco style. The asada and al pastor had great flavor, and the peppery salsa roja gives the tacos a little bite. It was nice having a grilled jalapeno to add a little extra heat. The burrito filled me up otherwise I would have had more tacos on my plate. There's solid competition in this area and it shows with trucks all being on their game. The fun seems to end after Tacos El Galuzo however. 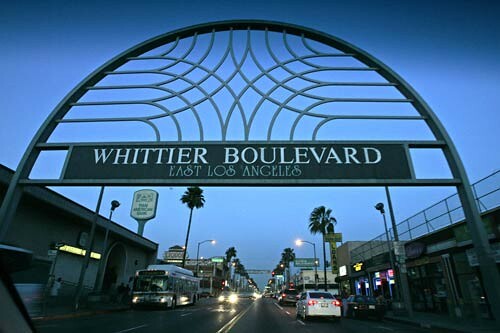 One night I took Whittier Blvd all the way past the Rio Hondo River and there were no tacos in sight. There's also a newish (last year) churros "trailer" right by Arandaz. Surely you've seen it? 3 for a dollar and pretty darn tasty. Thanks for this round-up. It's almost my 'hood. didn't see it this time. Sounds good though!